Roman Republic. L. Calpurnius Piso L.f. L.n Frugi. ca. 90 BC. With a Grasshopper symbol. Reference : Sear-235/1 variety. RSC Calpurnia-11. Size : 17.7 x 21.7 mm. Weight : 4.20 grams. 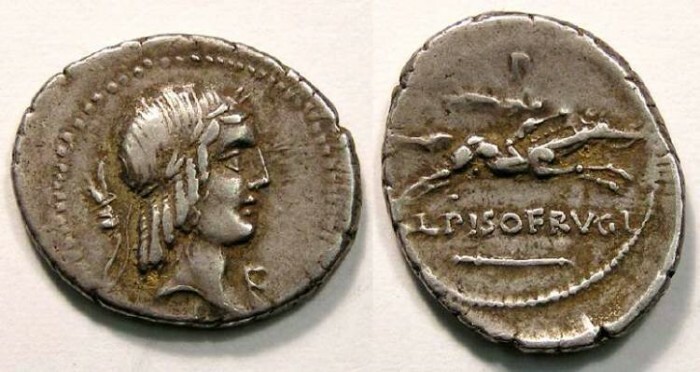 Obverse : Head of Apollo right, with a small grasshopper behind, and an F by the chin. Reverse : Horseman galloping right, with a Greek letter G above, and L PISO FRUGI below.